The structure of DNA was originally discovered by using X-ray crystallography, which involves scattering X-rays off atoms in crystallized arrays of DNA to form complex patterns of dots on photographic film. Images were then interpreted using complex mathematics. 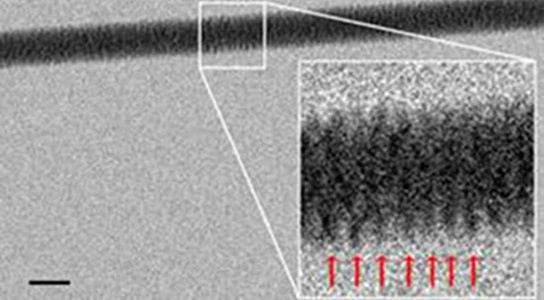 These new images are now direct pictures of DNA strands, seen through an electron microscope, which sees electrons rather than photons. The scientists published their findings in the journal Nanoletters. Enzo di Fabrizio, from the University of Genoa, Italy, and his team were able to snag DNA threads out of a dilute solution and lay them on a bed of nanoscopic silicon pillars. The pattern of pillars is extremely water-repellent, causing the moisture to evaporate quickly and leave behind strands of DNA stretched out and easily viewed. Tiny holes were drilled into the base of the nanopillar bed to allow beams of electrons to shine through, creating the high-resolution images where the corkscrew thread of the DNA double helix is clearly visible. This technique will allow researchers to view single molecules of DNA interacting with other molecules. For now, the method only works with cords of DNA, made up of six molecules wrapped around a seventh acting like a core. This was needed because the energy of the electron streams could break apart a single DNA molecule. More sensitive detectors, which respond to lower-energy electrons, should allow the visualization of individual double helices, and even unwound single strands of DNA. This could allow them to see DNA at the level of single bases. 1 Comment on "First Electron Microscope Image of DNA Double Helix"
If the memorial particles are chromosomes,during the smoker’s hallucination ,the helix of chromosomes must be observed in different pattern of composition.